We got up at 07:30 to shower and leave early so we could make it to the Sagrada Familia cathedral in plenty of time for our 09:45 admission. We had a quick breakfast in the same cafe Forn del Cel as yesterday, this time ordering a caña each, a custard one for M. and a chocolate one for me, which was rich and sweet. My Spanish is slowly getting better, though of course they all speak Catalan here instead, so I've started to adapt to that, with "gra-sya" rather that "gra-thyas". From the cafe we walked the additional block to Urgell metro station and caught the train to Sagrada Familia. As soon as we walked out of the Metro station we were amazed by the size and majesty of the cathedral, which occupies an entire city block, between two adjacent blocks which are parks. We emerged in front of the Nativity facade, which occupies the north-eastern side of the building. 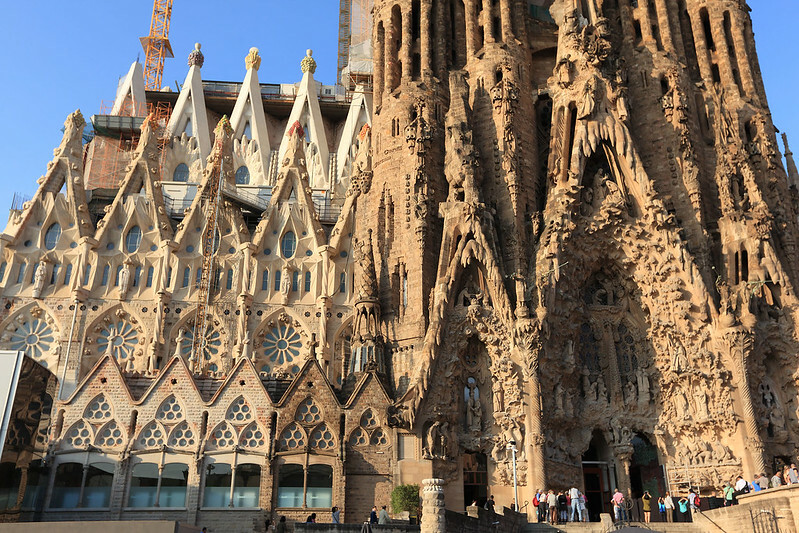 This is the oldest part of the building, mostly completed within Gaudi's lifetime, and the sculpted figures emerge almost organically from the stone, which appears to be dripping and melting, forming a scene of Christ's birth. This is also the side where visitors enter, after having bought tickets either online or in person around the other side of the building - the Passion facade on the south-west face. We were early enough to walk around the entire building and saw the ticket queue stretch a quarter of the way around. The front of the cathedral is on the south-eastern side, and is still under construction, nowhere near completion. Fruit-topped spires on Sagrada Familia. We went to the entry point, which happened to be specifically the spot where I'd arranged to meet Jan, and he and his fiancée Cynthia arrived shortly afterwards. We went in through the entry gate, where the tickets I'd bought and downloaded onto my iPad were scanned by a lady who didn't even blink at me having them on the device rather than printed out. The limited entry time system worked reasonably well, as the cathedral was full of visitors, but never so many that it felt too crowded, like when we were at Notre Dame in Paris. Walking inside was amazing. 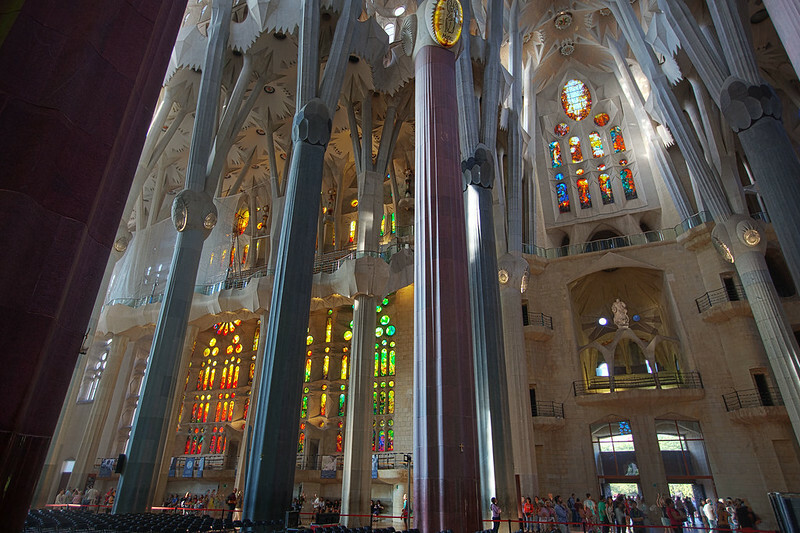 Rather than a dark and oppressive space like many Gothic cathedrals, the interior is airy and light, with spidery thin looking columns reaching soaring heights before splitting into even thinner supports, curving gently as they reach upwards, the whole lit in a kaleidoscope of bright colours by numerous large stained glass windows, which spilled their light across the sandy coloured stone. The whole space glows in a bathing radiance that draws the eye to explore all the corners of the interior. Enormously tall spiral staircases can be seen climbing to the high ceiling in the corners. At the junctions points where the four thickest columns around the centre split into thinner columns, they swell into ellipsoid shapes, on which are mounted elliptical plaques in bright colours, one each for the apostles Matthew, Mark, Luke, and John. Smaller plaques adorn smaller columns, with other names and symbols on them. Some of the spaces for plaques are still empty, presumably being constructed. 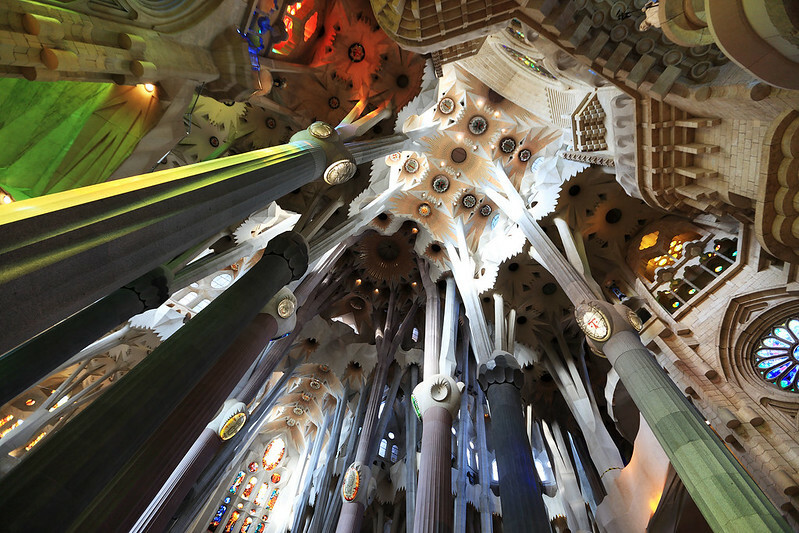 Sagrada Familia pillars and ceiling. We walked around the interior slowly, absorbing the details. 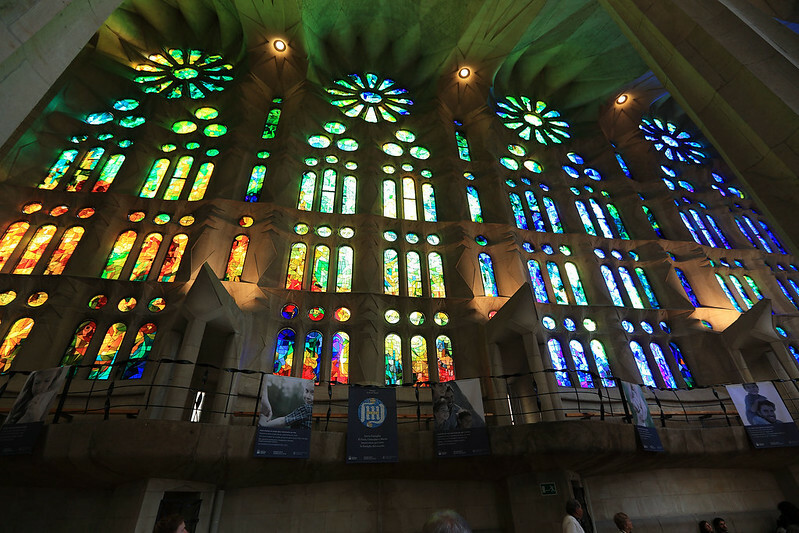 The stained glass is modern in appearance, with geometrical shapes in bright colours that shift slowly as the windows progress around the building. One window is predominantly red, the next shades into orange, the next to yellow, and so on. The central part of the interior was roped off, and contained chairs for sitting, and also some construction workers setting up movable scaffolds and doing some work wiring up TV screens. There is also a lot of active construction on the exterior, with scaffolding over bits of the structure and multiple very tall cranes hoisting stuff up into the sky. A chapel behind the altar was roped off for prayer only, and near this were windows through which one could look into the crypt below. 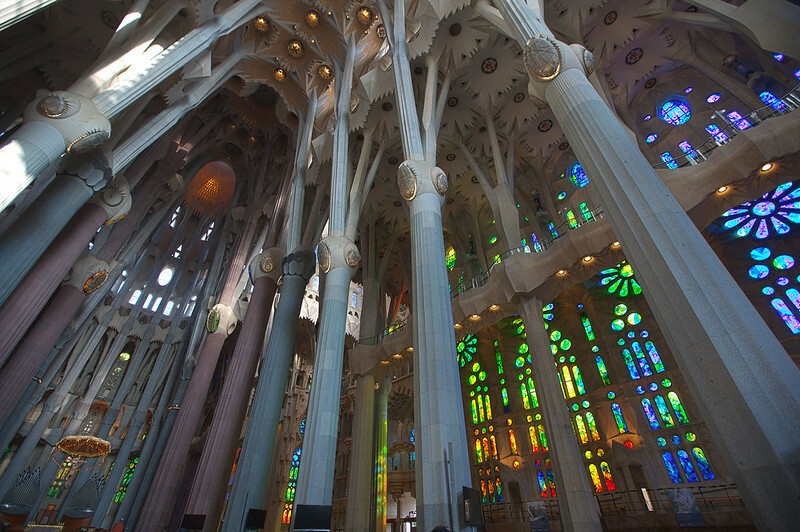 Stained glass windows in Sagrada Familia. After walking around the floor of the cathedral, we exited through the Passion facade. On this side was a large gift shop, where we looked for a few minutes. 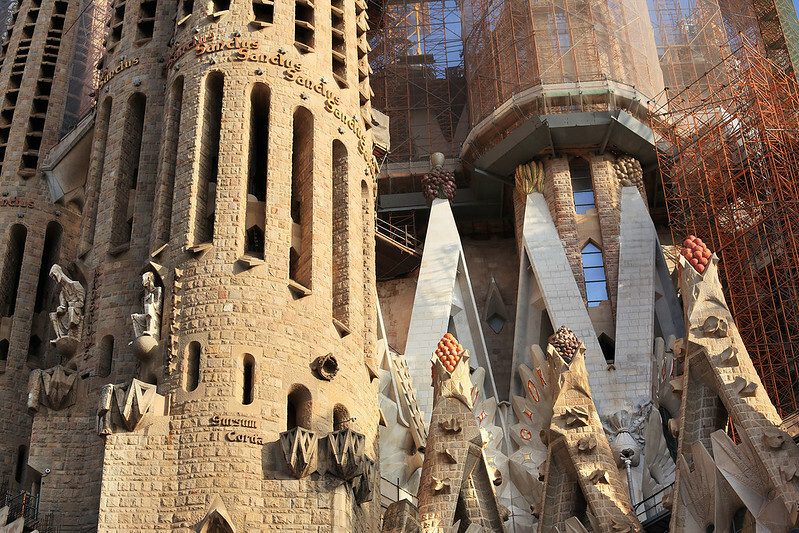 There is also a separate low building designed by Gaudi to house a school for the children of the construction workers working on the cathedral. This brick building is interesting in its own right, having interestingly rippled and slanting walls and roof. I spotted a door leading into a basement section of the cathedral, but by now Jan and Cynthia were ready to leave, so we said goodbye and that we hoped to see them again after they are married next year. M. and I walked into the basement, expecting maybe a room or two of stuff to look at, and found it to be an extensive gallery of material about the history of the cathedral, from its beginning in the 1800s to when Gaudi took over the architectural work in 1883, through the construction of the various parts which have been built so far. It included plaster models of various sculptural elements; miniature models of various parts of the designs of the walls, columns, and roof; drawings of the completed structure; and photos of various stages in the construction. We also got to see some original architectural drawings by Gaudi, and through a window looking down into the crypt, Gaudi's tomb. 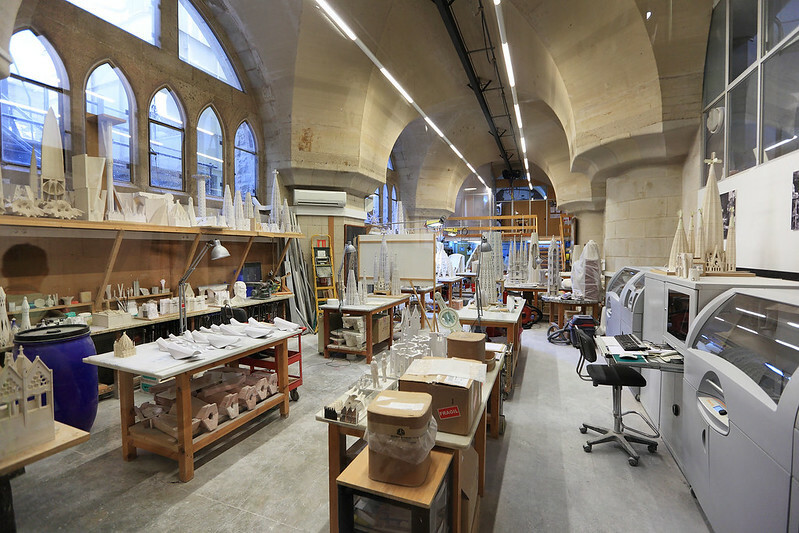 The large architectural and modelling workshop is also in the basement, and we saw into it through large glass walls at the people working there. Architects' workshop underneath Sagrada Familia. We emerged eventually back on the Nativity side, where we finally said farewell to the cathedral and made our way back to the Metro. We took a train to Gràcia station, where we got off to have a walking through this village-like neighbourhood of Barcelona. We have stopped in the Bar Canigo on Plaça de la Revolucio de Septembre de 1868 in Gràcia, for a cold drink and to escape the heat of the afternoon sun for a bit. 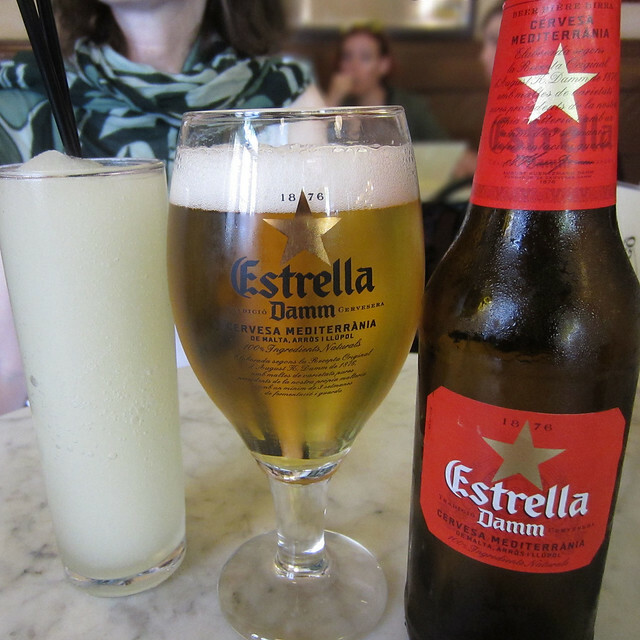 I'm having an Estrella beer, and M. is having a lemon granita. 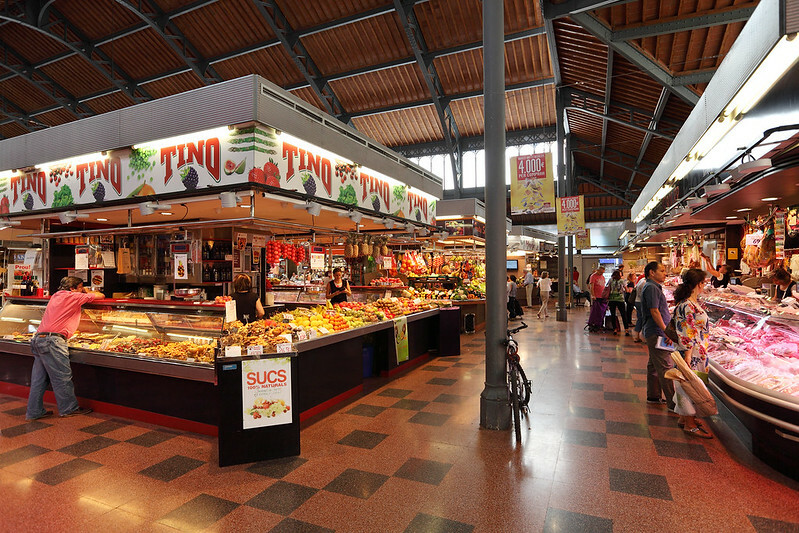 Immediately after arriving in Gràcia earlier, we walked over to Mercat de la Llibertat, the local food market. Before going in, we stopped in the adjacent Cafe Reunion for a drink, cafe con leche for M. and a fizzy mineral water for me, and to use the facilities. 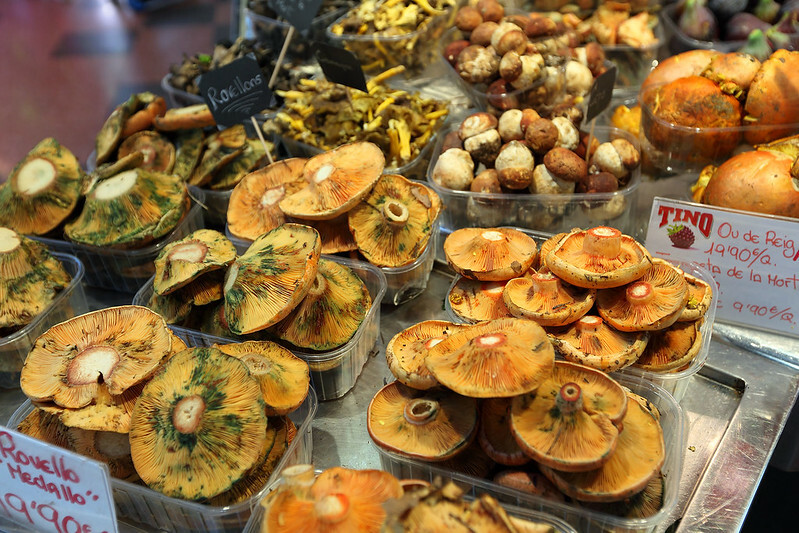 Once done there, we ventured into the market. This was something like the Mercat de la Boqueria which we saw yesterday just off La Rambla, but smaller and much less touristy. It was far less crowded, with only locals buying supplies, and none of the stalls selling colourful fruit juices to thirsty tourists. There were butchers, seafood sellers, fruit and vegetable stalls, a place selling olives and other preserved stuff, chocolates and nougat and other sweets, and in this one there was a baker with bread. 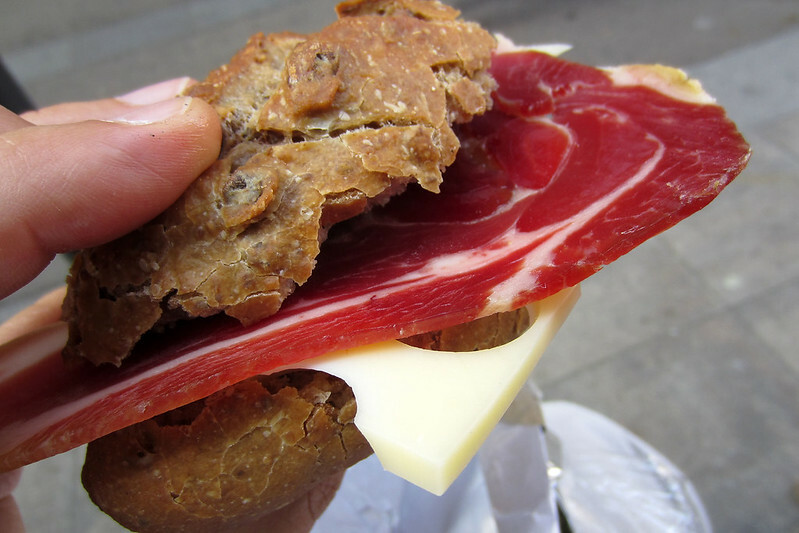 We fumbled our way through enough Spanish to get five small bread rolls, three dark rye ones and two whole grain, then six slices of some sort of Swiss cheese, and finally three slices of Spanish jamon. When we were getting the cheese, indicating slices with sign language and asking for six, an old woman came up next to me and started pointing and saying something urgently to the woman slicing the cheese and/or me. The only word I thought I understood was "grasa", which means "fat". I didn't know if she meant the cheese was too fatty for us, or the lady was cutting the slices too fat (they were quite thick), or we'd get too fat eating so much cheese. The old lady gestured at the cheese and us, and then the woman cutting the slices cut a couple of small pieces and handed them over for me and M. to taste. It was fine and we were happy for her to continue slicing. At the meat stall I picked one of the more expensive slabs of Iberian jamon which was sitting there, for 45 euro a kilo. There was one for just 18 euro, but I figured I may as well go for the good stuff. I asked for three slices and the woman gestured to ask me how thick I wanted them. I held my fingers close together to indicate quite thin, but the slices ended up about two millimetres thick. Jamon and queso roll, made from ingredients bought in the market. After getting the bread, cheese, and jamon, we also bought four fresh figs for me and a pear for M. from a fruit stall. Then we went outside and found a place to sit on the marble window sill of a shop in a shaded street nearby. Several other people were also sitting there, so we assumed it was okay. I constructed ham and cheese rolls while M. just ate alternate chunks of bread and cheese. The ham was salty and chewy and made the cheese sweet very sweet in contrast. The bread was very good too. It was a fine lunch, and cheap, the whole lot costing under ten euro, and we were both full afterwards. 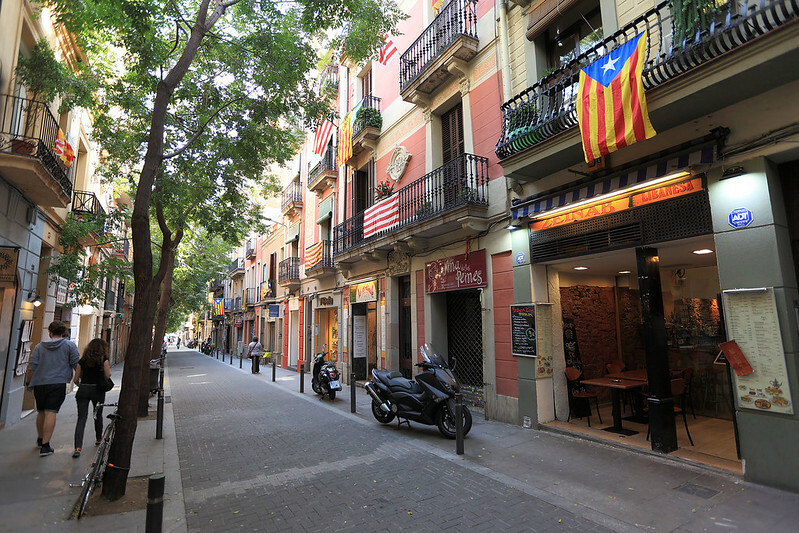 After eating, we did a walking tour of the Gràcia neighbourhood, roughly following the itinerary shown in our Lonely Planet guide book, but deviating a bit where we missed a street or got confused by the narrow alleys here and there. This pleasant stroll occupied most of the afternoon, punctuated by a stop at Bar Canigó for a cold drink to cool down, as described above. We are back at our hotel and planning to go down to the hotel restaurant for dinner soon. 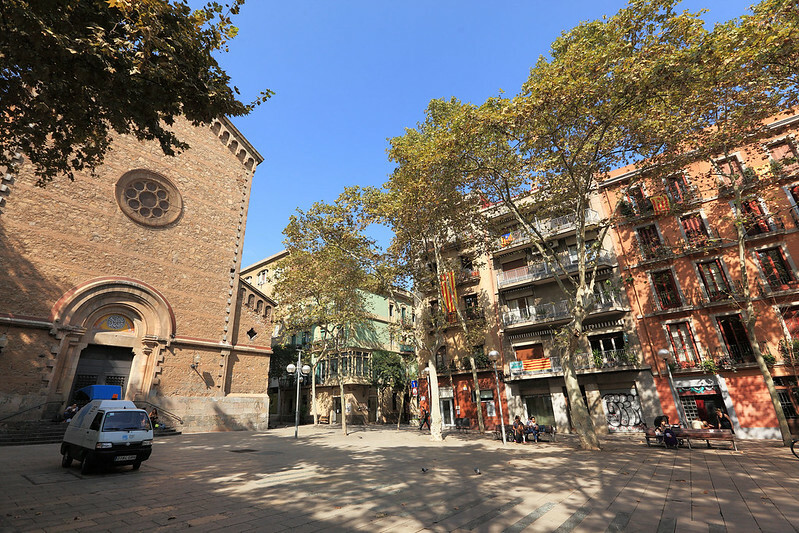 Sant Joan Baptista de Gràcia, Plaça de la Virreina. At the end of the walk, the region filled with fashion shops and expensive goods. We took a small break in the shade until a shop M. liked the look of reopened at 17:30, and then she had a good look around and bought a bracelet, while I sat on a step outside and write some of this diary. 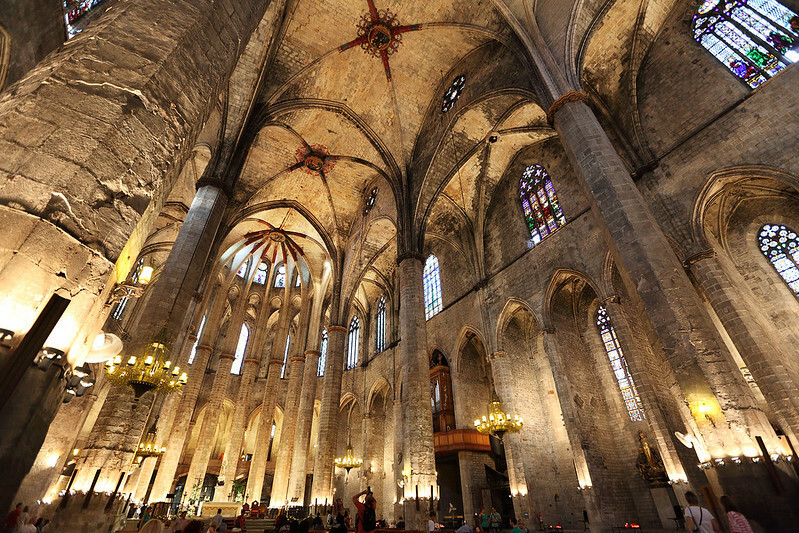 After that we walked the short distance to Diagonal Metro station and caught a train to the Jaume I metro stop, to look at the Iglesia de Santa Maria del Mar. 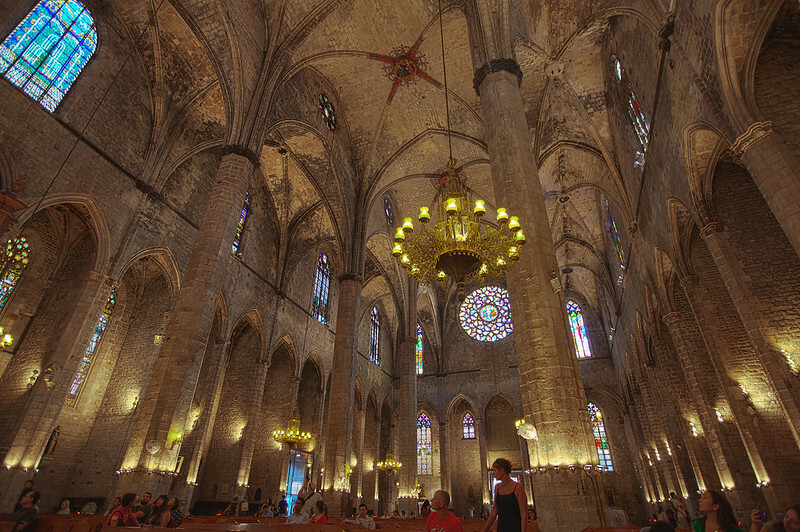 This is another large Gothic church, to contrast with La Catedral and Santa Maria del Pi. It has an enormous rose window above the entrance and soaring columns with vaults spanning a wide internal space, making it seem spacious and light for a Gothic cathedral. As we arrived, a wedding was just finishing, with the bridal party posing for photos standing on the steps, amidst scattered flower petals. We entered behind the bridal part as the photographer was lining them up for another photo. The lights were on inside the cathedral when we went in, but within a few minutes most of them were turned off, so it was fortunate I took my photos before then. As we emerged and walked back up the street to the Metro station, the bride and groom were having photos taken strolling along the narrow pedestrian street. We considered having dinner at a tapas restaurant near the cathedral, but decided we'd end and get back late, which we didn't want to do since we had to be up early to go to Park Güell tomorrow morning. So we decided to head back to our hotel and eat in the restaurant there. We have just finished the starters and main courses of our dinners in the hotel restaurant. They have a two or three course special, so we went for those, with M. declining a dessert course. I chose the pumpkin cream soup with herbs, sea bass in white wine sauce with potatoes, onion, and tomato, then white chocolate cheesecake. M. picked the garden salad, followed by ravioli stuffed with cheese and spinach, in a cabrales cheese sauce, cabrales being a regional blue cheese unique to Spain. The special also comes with a glass of wine, for which I chose white to go with the fish, and M. chose rosé. The white tasted of honeydew melon with a touch of lemon peel, while the rosé is reminiscent of strawberries. The cheesecake was served warm, which was a bit odd, but was otherwise acceptable. 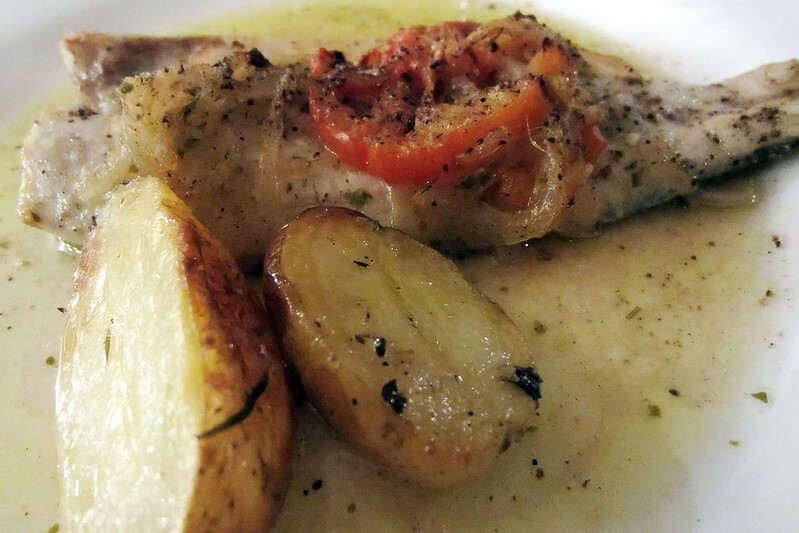 Sea bass in white wine sauce. After dinner we returned to our room. M. read some of her mystery novel because she wanted to finish it before getting on the plane tomorrow. Last updated: Monday, 30 March, 2015; 01:45:52 PDT.